One of the most important things about the recovery effort is keeping in touch with you. Social media has been a wonderful, effective tool. However, the official forms of communication are so essential in resuming normalcy on the Bethune-Cookman campus. 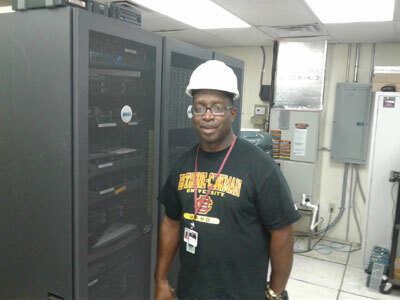 For that, extend thanks to Telecommunications Manager Darryl Spain, who will in turn, thank his colleagues in the Center of Information Technology… and even to those on campus servers who have yet to go down. The official web site, yes, went down for a little while Monday, but that had to do with connectivity issues with a service interruption that shut down all of Daytona Beach. As soon as that happened, Spain was in contact with John DiNardo, the Director of Network Support Service and Telecommunications, who has been managing his tasks via remote. All the emails and website content was backed up and sent to a server in Miami. Yes, Miami. Those servers never went down, either. Also part of this team is Julian Walker, who has been updating the web site content as fast as provided. And it isn’t just internet and email. All of the University’s official cyberspace, including the ones with student grades, are safe and sound in an air-conditioned vault in Faith Hall, purring like kittens. Spain’s very proud of the servers, also. It’s like on Star Trek the way Scotty treated the Enterprise’s engines like children.